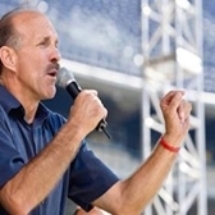 Lou Engle is an American Charismatic Christian leader, best known for his leadership of The Call, a program that hosts twelve-hour prayer rallies. Engle was a senior leader of the International House of Prayer and has assisted in the establishment of several smaller "houses" of prayer. Click below to read his awesome words of encouragement. “The ministry of intercession was the most real and tremendous. The word womb in this passage is translated from the Greek word koila. In John 7:38 it says, “Out of his innermost being will flow rivers of living water." The word for innermost being is also the term koila. So, spiritually speaking, everyone of us has a womb to give birth to a manifestation of Jesus. Likewise, we believe California’s womb has conceived a new Jesus Movement and could now be entering into travail and birth. There is something about Santa Maria (whether it’s about the city, or about the calling on the state of California right now), it’s to give birth like Saint Mary did! Mario Murillo tells the story of his laboring in Berkeley among the student radicals of the 70’s. One night he was wakened with an agony of soul. In deep groans he poured himself out, broken for the lost. He staggered into the woods praying, thinking he would die from the Holy Spirit’s intense intercession within him. Then, suddenly, the burden lifted just as it had come and the angel of the Lord said, “Today, Mario, I’ve given you the city.” With newfound faith and expectancy, Mario went into Berkeley to preach the gospel that day. He was humiliated and devastated by a student radical who ripped up his tracks and spit in his face. But then, a young man walked up and confronted the student saying, “Do you know who this man is? This man is Mario Murillo and this day God has given him the city.” The radical apologized sheepishly and the man with the message disappeared. Was it an angel? Mario only knew that within the next two years, 2000 students came to Christ. Come on California! It’s time to give birth, by the Holy Spirit, to a new day of salvation! Father, we pray, give us the universities of California again, as you did in the 60’s and 70’s. Raise up evangelists. Raise up intercessors. Loose a supernatural burden for souls that cannot be worked up by religious flesh. Loose your travail that brings forth another salvation student explosion in the high schools and campuses of the Golden State. Open the womb of California once again. Amen. Knowing that “congress” is a legislative body, our friend pondered, “Is God summoning His ekklesia to deliberate over the affairs of California?” Later, when he received Lou’s invitation to the California Dreamin’ fast, he knew this was that. We believe we are to deliberate in prayer over all of these areas mentioned above. However, our friend explained how he sensed his dream may have an additional application to marital affairs specifically. We resonated with his insights and also sensed an application to prodigals who have strayed from the Lord as their true Bridegroom. Together we felt expectancy leap in our hearts, knowing that heaven has reserved for itself the final word over these “affairs” of God’s people. This reminded me of another dream I had a few years ago in which I was shown that California was a “prostitute state” but God wanted to marry her once again. This kind of language and imagery can also be found in the book of Hosea the prophet. Hosea was directed by the Lord to marry a promiscuous woman named Gomer. Their story became an allegory of God’s relationship with adulterous Israel and a prophecy of how He would win her back to himself once again. May we be encouraged by these dreams and scriptures and the implications they hold for California. It is right to hope beyond hope for an adulterous generation because Jesus has already paid the price of redemption once for all. His mercies are new every morning! Now the Lord is looking for men and women of faith who will hear His heartbeat, appropriate the sacrifice of His Son, and take captivity captive. It’s time for the congress of God’s ekklesia to assemble over California and release the rains of His mercy! Oh Righteous Judge of the Earth, we approach your throne with great boldness because of the blood of your Son, Jesus. Thank you for making us righteous before you. We ask you to forgive the sins of your people who have, even now, turned from you in various ways. Lord, your judgments are right and true altogether but we know that your mercy triumphs over judgment. Thank you for showering California in your mercy as we stand in the gap. We take authority over the veil of deception that rests upon the people and we cast it down in your name. By the sacrifice of Christ we declare, “Freedom to the captives and recovery of sight to the blind!” We call for the prodigals to come home and we release the rains of revival like a pent up flood over the affairs of California! An intercessor once dreamed of a prayer room with a prayer wall. Hundreds of names were pinned to the wall like you would see at the Wailing Wall in Jerusalem. He realized that people from all over the country had sent in the names of loved ones who needed freedom and salvation. Those names were then taken up in intercession until they could be pinned on the testimony section of the wall. The testimony side was filling up with names from the prayer side of the wall and they all came under the heading: “The Lamb's Reward.” It was clear that Christ had paid the price for both the intercession and salvation of these ones He had died for. I believe that as we enter the time of the great Billion Soul Harvest*, God is re-highlighting his simple strategies and heart for this end-time harvest. A primary strategy is, “Start with the one.” I was once leading a passionate prayer meeting for the Billion Soul Harvest when I heard the Lord speak to my spirit. It was the middle of the meeting as we were shouting out promises and claiming the billions when the Lord interrupted me and said, “The billions are made up of ones.” Broken ones. Hurting ones. Poor ones. Abused ones. Depressed ones. Blind ones. Lost ones. God doesn’t look at the billions as a large robotic mass of people aimlessly wandering on a make-believe planet called Earth. God carefully formed and intimately knows each one by name. I think about a young Billy Graham before he was known as the great worldwide evangelist. After a night of passionate prayer with a few friends in a SoCal campground in 1947, they made a covenant called “The Burning Heart Contract.” They committed themselves to four principles of Christian discipleship that included: (1) one hour in prayer and the Word, (2) sobriety, (3) fidelity/chastity, and (4) “to seek every possible opportunity to witness, to the end that I may be responsible for bringing at least one to Christ every 12 months.” I believe it was Billy’s commitment to witnessing to the one, while no was looking, that gave him the platform to preach the good news to 201 million people over his lifetime. Who were the other friends that made this commitment with Billy? Bill Bright, Henrietta Mears, Richard Halverson, and Louis Evans. In Exodus 28:29, the priest was never to enter the presence of God without names written across his heart (breastplate). The mere sight of the names of the precious ones that God created, deeply moves His heart. As we pray and fast for the great harvest in California, take the names of your family members and friends, write them on your heart, and pray for each one by name. It is through these ones that much of the great harvest will come. When Jesus reached the one Samaritan woman, he reached the entire city. When Ananias ministered to Saul, who later became the apostle Paul, he reached the Gentiles. The greatest harvesters are still in the harvest fields. As a royal priesthood, if we would be faithful to carry them on our hearts before the Lord in prayer and share the love of Jesus with them, the millions and billions are not far behind! Lord, forgive me for forgetting about the ones that are on your heart. Sear the names of the lost on my heart! May my heart burn with love for the lost ones again. I bring before you today my family members, friends, and co-workers who don’t know you. [List them by name]. Save them. Deliver them. Heal them. Use them to bring salvation to the masses! Lord, as we’re faithfully loving the ones, give us the millions and the billions! My friend Chris Berglund had another dream several months ago in which he saw Billy Graham sitting in a rocking chair behind home plate on a baseball field. Billy had an umpire mask resting on his head and he had the ability to call people “safe” or “out” (it was the salvation message - safe or out). Billy also knew where people were to be on the field. Chris recognized that though umpires were supposed to be neutral, Billy Graham wasn’t neutral. He was totally invested in the game. The guy on third base yelled, “At Billy Graham’s home-going the greatest evangelistic outpouring will be ushered in.” Chris was so overwhelmed by this statement because he knew there was no way we could train enough people to be ready for this. Can you see Jesus standing on the shore of California? It’s time to heed his voice and cast our nets! Lord of the Harvest, use us! Help us! May we be for you ready vessels. Bring us new strategies for this new wave of evangelism - nets that will catch and hold the multitudes! Empower your laborers in California, Lord, with a spirit of counsel and might. Move through us to bring home many sons and daughters to the glory of your name. I saw frisbees of different shapes and sizes flying all over the California beaches, up to Canada and down to Mexico. Then I saw Bill Bright, A.A. Allen and Billy Graham. AA Allen said: “Do you have eyes to see the treasures I see or will you miss being the wisdom and healing for those I raise up to fly?” After that, Isaiah 49 was being spoken. The phrase “Though you may not have compassion on your son I will never forget you…" kept reverberating in me. Then I heard it said, “Who will believe that a highway of holiness and love can come to the street called hate (Haight)? Who is there that sees a heavenly kingdom that's more powerful than any earthly strongholds? To such a one I will show myself strong." Lonnie Frisbee may have been the key voice of salvation and power in the days of the Jesus Movement. Up and down California people were saved and baptized in the Holy Spirit through his life and ministry. He was a broken man but God used him mightily. Can we see the treasures of Christ in broken vessels or will we miss being the wisdom and healing for those whom God is raising up to preach? Lonnie Frisbee came out of the Haight-Ashbury hippie culture of San Francisco. We believe God will do it again in the city of St. Francis. God is inviting us to see one another according to our heavenly calling and destiny and not according to our past or present behavior. When we see Christ clearly, we begin to see ourselves and others differently. Let us say what heaven says about others, releasing revelation and faith into their hearts. Then, grace can come to empower transfiguration. The Frisbees are flying once again over the West Coast! God, this is my prayer, that you would forgive us of our doctrinal policing. Scrutinizing our brother according to the flesh and accusing one another when the days of harvest are at hand. God, raise up harvesters of every kind. Lord, help us to see the treasures in the next wave of the Jesus Movement and not judge them according to their appearances. We ask forgiveness that so many missed the Jesus Movement because they couldn’t see beyond their own cultural lenses. Don’t let this happen again in California. Raise up the Lonnie Frisbees. Heal them and let them fly in Jesus Name. As I mentioned in my last two posts, I had a question burning on my heart the entire year of 2015, “Why haven’t we yet seen the fullness of the next Revival, Great Outpouring, Great Harvest, Jesus People Movement, etc?” That year, I had three significant dreams providing answers to that question. This is the last of the three dreams. I love the story of a young Oral Roberts who fasted and sought God for seven months for a greater breakthrough in his ministry. While he had ministered to hundreds, God had promised him that he would bring healing to an entire generation. Over the last three months of his time of seeking God, he lost 40 pounds in fasting. Finally, one night in divine frustration, he got on his face before the Lord and told God that he would not get up until God spoke to Him. He prayed until he had nothing left and then lay on the floor waiting for the Lord. After a long period of stillness and silence, God finally spoke: "From this hour you shall have My power to heal the sick and to cast out demons." In his next meeting, 1200 people showed up and he had his most incredible healing ever. Roberts had experienced breakthrough. Oral Roberts was a mighty spiritual giant who wrestled like Jacob wrestled. Imagine Jacob letting the angel go with the intention to wrestle him at a more convenient time or another day. The truth is, Jacob didn’t have that option. He knew the time was urgent. He needed breakthrough that night or he and his entire family could be destroyed by Esau the next day. This is the kind of urgency that we need in this hour! The greatest enemy to urgency is apathy. Oh, that God would set ablaze every apathetic bone in my body. Oh, that God would set ablaze every apathetic bone in the body of Christ all over California. It’s time to awaken! We need the violent rushing waves of revival to sweep over our state TODAY. Not tomorrow. Tomorrow may be too late. "Every valley shall be raised up, every mountain and hill made low." I was flying in a Learjet over a large river where hundreds of fishermen were catching hundreds of salmon and all kinds of fish. The Lord said in the dream, “Now, both the harvesters and the harvest are ready!” Then, as the plane began to elevate, the pilot said, “There are three things you leaders must do in this season for divine take-over: 1) You must come up higher! 2) You must lose all fear, and 3) you must take risks!” Then he proceeded, “And you see those mountains below us? You can have all of them if you will do these three things!” And then, in the dream, we passed through some kind of barrier. Step out into the dream and make it real. Risk everything for the promise. We declare today, by the power of the Holy Spirit, that we are crossing the barrier of fear and intimidation. We will not let the lack of finances keep us from stepping into our dream. We declare that God is raising up an army of Josephs and Esthers who will be exalted in high places of cultural influence and His Kingdom will be manifested in glorious authority. Amen. I was walking through what seemed to be a heavenly location and encountered a man along the way. As I was passing, this man suddenly cried out to God with a loud voice, “Why?! ?” I knew this man was asking the same question that I had been holding before the Lord, “Why haven’t we seen the fullness of the promised revival and great harvest yet?” As I walked closer to the stranger, I could see that he was King David! I immediately remembered how David would often inquire of the Lord. My heart resonated with his cry and I too cried out, “Lord, Why?! ?” Immediately, Psalm 51 came to mind, the Psalm that David wrote repenting for his sin of adultery and murder. I asked King David, “Should we start with repentance?” He nodded yes and the dream ended. While we long for billions of souls to repent and flood the kingdom, we realize that repentance must begin with each of us. Have I tolerated besetting sins, offense toward my brother or sister, gossip or unforgiveness in my own life? Let us stand like the publican (tax collector) and David and ask the Lord to forgive us from our own sinful ways and cleanse us from all unrighteousness. May this be a time that we go to our brothers and sisters and confess our sins one to another, so that our lives, families, state and nation may be healed. I often think of California as the Samaritan woman at the well. Jesus had to visit her first before the rest of the city could be converted. The Samaritan woman was living a life of sexual immorality and deep shame. Yet, when Jesus encountered her, she immediately repented and instantly became a great evangelist to her entire region. I believe that California has the same destiny. It’s time for another move of God in California! Let it begin with repentance. Let this be the hour that California responds to God in repentance like Nineveh in the days of Jonah. God, we humble ourselves in repentance for ourselves and our state of California. As we pray for the rains over California, we ask that you would shower down the rains of your mercy over our own lives and our entire state. Jesus, we plead your blood over our sins and the sins of California. Only you can wash away our sins and make us white as snow. Excerpt from letter to Frank Bartleman written in 1905 by Evan Roberts, catalyst for the Welsh Revival, in response to Bartleman’s request that Roberts pray for California. "And will not [our just] God defend and avenge His elect [His chosen ones] who cry out to Him day and night? Will He delay [in providing justice] on their behalf? 8 I tell you that He will defend and avenge them quickly. However, when the Son of Man comes, will He find [this kind of persistent] faith on the earth?"" Luke 18:7-8 (AMP). For the entire year of 2015, I had a question burning on my heart, “Why haven’t we yet seen the fullness of the next Revival, Great Outpouring, Great Harvest, Jesus People Movement, etc?” That year, I had three significant dreams that I believe contain important parts of the answer to the question I was holding before the Lord. When I awakened from the dream, I knew that it would require DAILY, persistent prayer to see revival in its fullness. At the time of the dream, I was a part of a group of united intercessors that would meet once a month at the Bonnie Brae House to pray that God would “do it again” and send another great revival far eclipsing the Azusa Street Outpouring. While praying for revival from time to time at historic locations or at large gatherings is significant, I believe that God is looking for consecrated individuals and companies of people all over California that will seek His face daily to see this revival break forth in all of its fullness. This is not about our human efforts. But faith without action is dead (James 2:26 ISV). In Luke 18, when Jesus asks if He will find this kind of faith on the earth, He teaches us that persistent day and night prayer is action that demonstrates our faith. When we give ourselves to something on a daily basis, it is evidence of how strongly we believe in it. Jesus is looking for faith. Faith is what attracts heaven to earth. It takes faith to ask and keep on asking, seek and keep on seeking, and knock and keep on knocking. Persistent prayer, especially when there is no immediate visible answer or breakthrough, is a sign of great faith that will not be denied. God, re-awaken me to persistent prayer. Like Seymour, give Your church in California the grace to pray and never grow weary. Lord, breathe on the faith of your sons and daughters in California and lead us to day and night intercession to see the fulfillment of every word promised in our generation!